Mighty Bright's LED Orchestra Light is the brightest in the business. 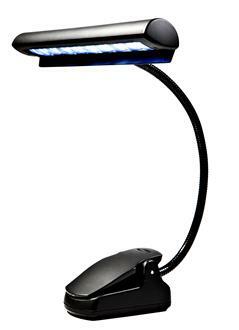 LOW POWER, BRIGHT LIGHT The sleek, black music stand light blends in, is tasteful and understated, and comes with a convenient travel case and AC adapter. Use the light with the AC adapter to enable centralized switching capabilities - perfect for large concerts. The long head features a row of nine brilliant LEDs and a sliding power button that offers two light level options. Set at the higher level to brighted up to four pages of sheet music. A discrete back fin directs light away from the audience and back to the sheet music. This stylish light is seriously sturdy, from clip to bulbs. The extra broad clip is a Mighty Bright exclusive design, with a powerful grip set on a broad base. The gooseneck is robust but allows users to make precise adjustments easily, even during a performance. Its energy-efficient LEDs are not only sturdy enough to withstand the rigors of tear down and travel, but they also heighten the contrast of the notes and words on sheet music. Lighting system? Check. Let the magic begin.